ODESSA, Ukraine -- The U.S. Navy’s guided-missile destroyer Carney sailed into Ukrainian waters Monday in the third visit by a vessel of its kind to the tense Black Sea region since August. The Ukrainian Navy Hetman Sahaidachny frigate (right) and United States Navy missile destroyer Donald Cook (DDG-75) are moored near one another during the international drill Sea Breeze-2015, which officially began in the southern Ukrainian city of Odessa, on September 1, 2015. A U.S. destroyer became the third such vessel to enter Ukrainian waters since August on Monday. The Arleigh Burke-class U.S.S. 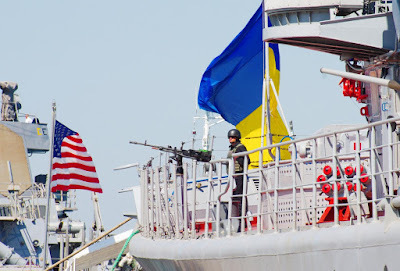 Carney docked in the port city of Odessa as part of an ongoing commitment by the U.S. military to show support for Ukraine, particularly in the face of Russian aggression. The former Soviet country has been locked into a prolonged standoff with Russia in its east and south. In 2014, masked Russian troops seized Ukraine’s southern Crimean Peninsula shortly after protesters had ousted the pro-Russian government of Viktor Yanukovych in Kiev. Russian armed forces in Ukraine’s eastern regions of Donetsk and Luhansk have also fought against Ukrainian government forces for over three years. The U.S., which has three military allies on the Black Sea basin, has pledged support for Ukraine and conducted a handful of drills with the country. The U.S.S. Carney was last in the neighborhood during a multinational drill in July that included Ukraine. “Returning to the Black Sea and Odessa is a familiar mission,” Peter Halvorsen, commanding officer of the ship said on Monday, according to a statement by the U.S. Navy. Since the fallout with Moscow, the U.S. has sporadically sailed warships in the region as a sign of support for unsettled nations in Russia’s sphere of influence. Following the end of Sea Breeze, the U.S.S. Porter and James E. Williams destroyers patrolled the waters in August and November respectively, meaning U.S. Arleigh Burke-class vessels have visited the area on roughly a bimonthly basis. Carney arrives in the Black Sea as part of the Pentagon’s Operation Atlantic Resolve, which is responsible for the annual rotation of forces throughout Europe. Regional allies and partners coordinate joint training events with the U.S. tour, and Moscow has frequently complained about touring U.S. forces. Russia has repeatedly voiced severe criticism of nonregional forces flexing muscles in the Black Sea—an area in which the Kremlin once enjoyed unrivaled dominance. Rhetoric against U.S. ships, which have “no business” in the region, according to a decorated Russian general, has sometimes resulted in tense run-ins. The U.S.S. Porter’s visit in February prompted two Russian fighter jets to zip at high speed very close to its deck.